I got back from dogsitting for my mom, and things are blooming! My asparagus peas are blooming with the most charming dark red flowers. I'll try and get a picture of those later. I collected some seeds from a gorgeous heirloom tomato -- Tigerlike -- and I'll be offering those later on in the year. It was tasty, too! 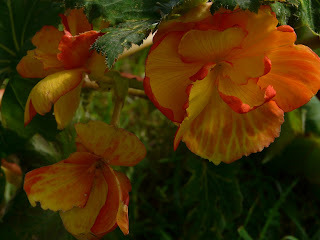 Here's a picture of my picotee begonia. This is the first blooming, and they're mostly yellow/orange with pink/red picotees. Rather fun and very pretty.